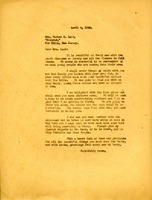 In this letter, the Phillips & Crew Manager informs Martha Berry they have gone over her combination are ready to release it. 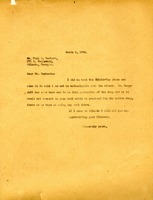 Miss Smith writes to enclose her Sunday School papers and ask what other kinds of papers Miss Berry might be interested in. She includes a description of herself, her Sunday School class and her music lesson pupils. 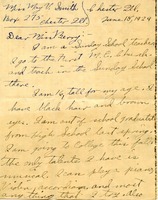 She asks Miss Berry to write soon and tell her new friend all about her Sunday School class. 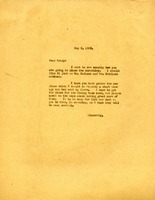 Martha Berry tells Ladd about the new piano and reminds Ladd that she wants a photograph of her like the one she sent for Lemley Hall. Berry hopes to see Ladd in Bar Harbor over the summer. Berry instructs Hamrick to place the dormitory just as Mr. Carlson and Mr. Cridland advised. 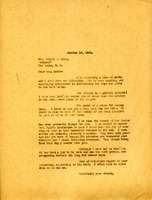 She hopes he has received the new piano and provides instructions for its placement and care. 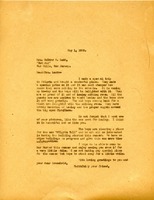 Martha writes Mrs. Ladd with a list of books and a note from the library as well as discusses Lemley Hall with Mrs. Ladd. Martha hopes that summer at Bar Harbor has done well for Mrs. Ladd as well. 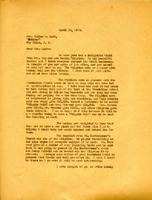 Berry remembers her visit with Ladd fondly, commenting on Ladd's loveliness. She plans to order the piano for Lemley soon, which the boys think is wonderful. 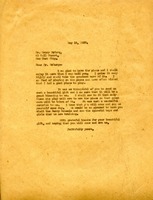 Martha writes to Henry thanking him for the piano that he sent to the school. Berry writes that it Warden will now have charge of all of the school's pianos, and that she will convey this information to Alice Wingo and others. Alice B. 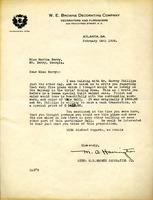 Harden shares with Martha Berry the status of the pianos in the Music Department. 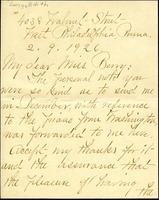 Edith C. Long says she was happy to have received Martha Berry's personal note, regarding the piano she left to the Berry Schools. 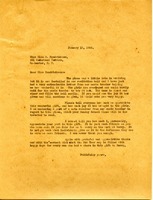 She also requests that Martha Berry send her more leaflets about the Berry School, so she can distribute them among friends. 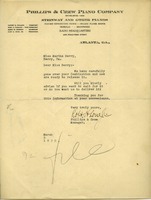 Martha Berry writes to Mr. Burkert about her misfortune in trying to purchase a piano and says if she comes to Atlanta she will call him up. 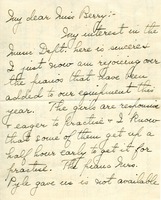 Miss Berry writes to thank Miss Hendrickson (and the others who had a part in the gift) for the piano and to tell her how much joy it has given the girls and says she "can never thank [her] enough."